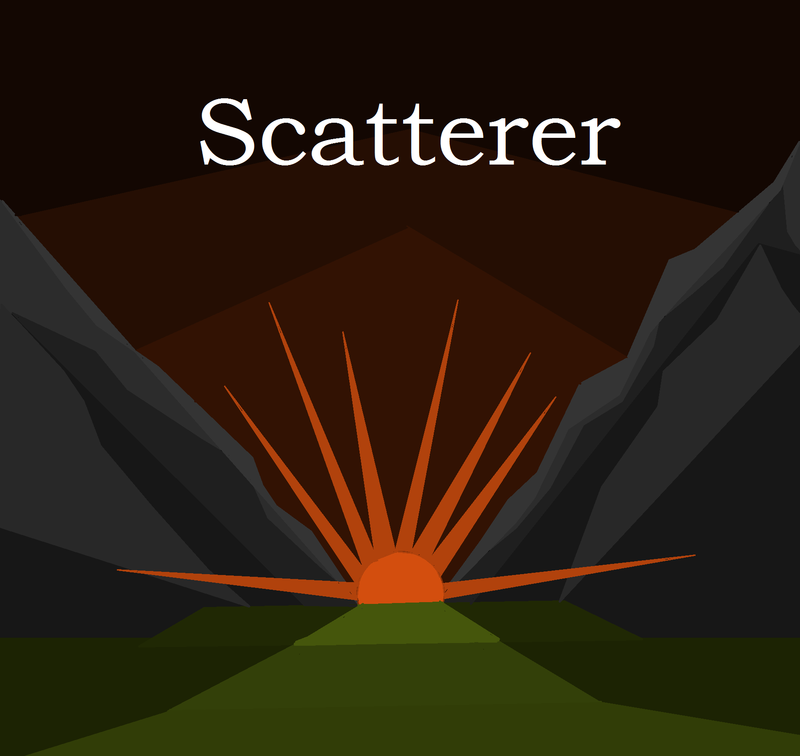 [WIP][1.6.1] Scatterer-atmospheric scattering (v0.0540 - 17/03/2019) FIXED TSUNAMI BUG !!!1!1! 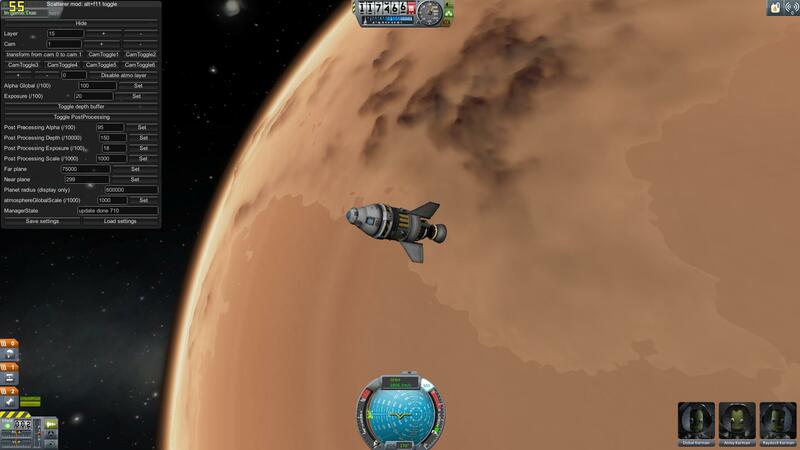 Scatterer is a graphical mod created primarily to add realistic atmospheric scattering to Kerbal Space Program. The videos in this section are a bit old and a few versions behind, anyone feel like making a fresh video? 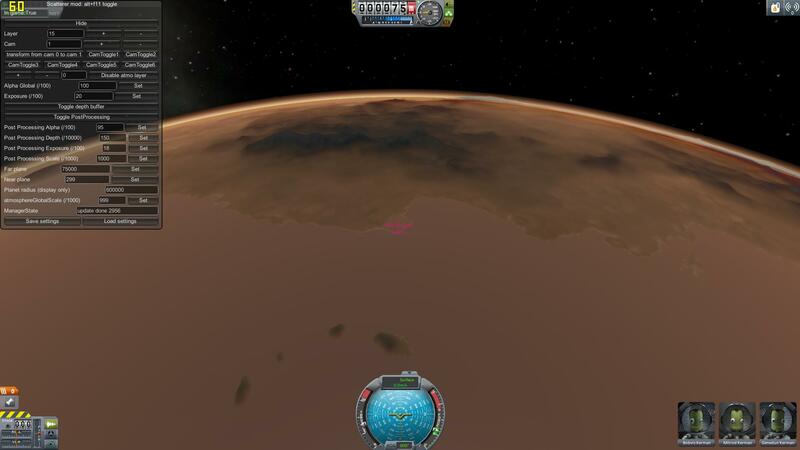 You also need to rename the "Duna" folder to "Mars" and "Kerbin" to "Earth". If you get issues with null references or the sunflare not working, try the one above. Config points are a system that allow you to define different value for settings at different altitudes, at each altitude a "point" is defined. This allows to tweak the settings to improve the look or work around artifacts at any altitude. Each point is a combination of an altitude value and scatterer settings. All config points are, and have to be sorted by increasing altitude, otherwise bad things happen. When below the altitude of the first point (number 0), the settings values of that point will be used as they are. When between the altitudes of two points (example point 0 and point 1) a mix of their two settings will be used based on the current altitude. Example, if point 0 is set at 1000m and point 1 is set at 5000m, the values used by scatterer at a 2000m altitude will be 75% of point 0 + 25 % of point 1. Hope this makes sense. You can browse between the config points, delete and add new ones in the UI. Always make sure to have them properly ordered by altitude. You can press the "show interpolated values" button to view the current values and how they are computed. -Screen-space reflections for the ocean. -Terrain shadows might cause weird, moving patterns to appear across the landscape, adjust shadow bias and shadow normal bias to fix this (for more info on what these do, go here http://docs.unity3d.com/Manual/ShadowOverview.html and scroll down to "Shadow Mapping and the Bias Property"). You can also try to turn up the rendering quality in KSP, mess with anisotropic filtering settings in the driver or force directx11. Note that why this is fixable for some people, for others nothing helps, if it doesn't work for you please don't complain. -Sometimes the game starts stuck in the KSC view zoomed on the SPH, whenever that happens press alt+f12, show input stack and press clear input lock and it fixes it, this is actually not a scatterer issue but gets reported here a lot. -RSS/rescale mods might not actually work and may have several issues. 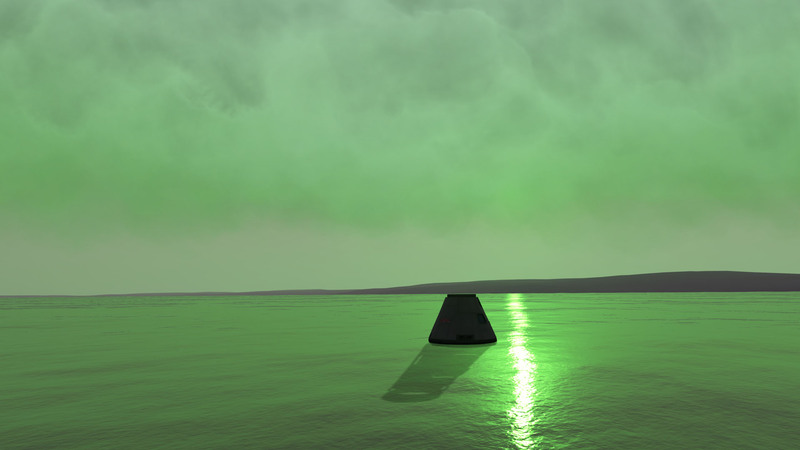 With ocean shaders enabled, default scatterer settings: Launch a ship from KSP, look at ocean, ocean flickers (appears and disappears) very quickly. Preferably submit your issue on github https://github.com/LGhassen/Scatterer/issues it will ease your life and mine. config tool is DX11 ONLY! This config tool will allow you to generate new precomputed tables for the atmosphere, basically this is the only way to tweak atmosphere colors. I haven't updated this in a while but you can ignore the planet name field. Rg is the planet radius (it says diameter in the tool but it's wrong) Rt is the height of the atmosphere. RL is the limit of the atmosphere but it works weird. 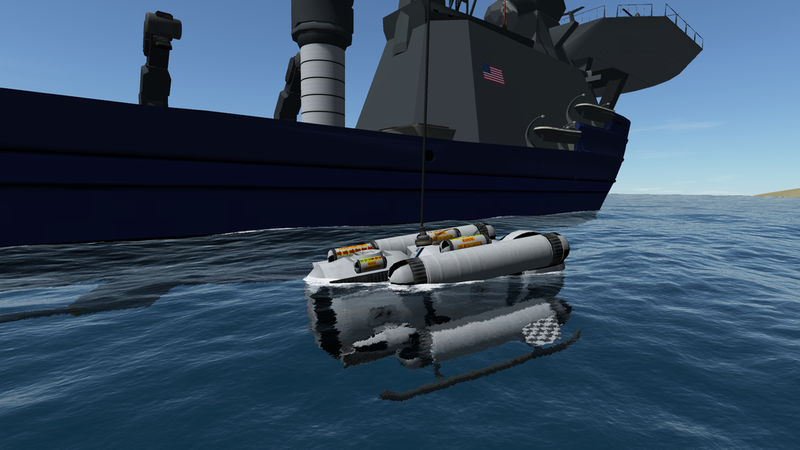 Also, you don't need to change Rg from the original value, just copy everything into KSP and it'll rescale automatically. Half heights are the height in km that half the particles are found below. If you modify Rt and Rl you have to modify these or you get artifacts. To use this, just enter your settings and press generate, if you're satisfied with the result, copy the .raw files (ScattererTool_Data\Proland\Textures\Atmo) and manually open the .xml file (\ScattererTool_Data) from the tool folder and copy the settings into your planet of choice's settings.cfg file in the scatterer folder and replace the files in the scatterer mod folder with them. 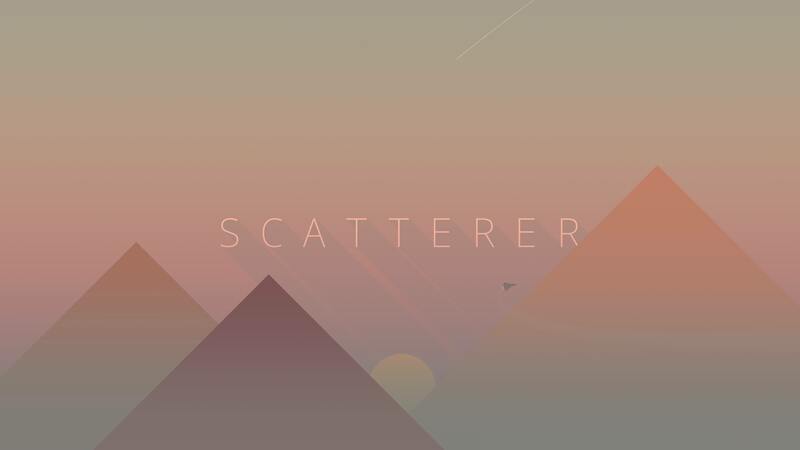 As of scattererv0.024 (1.1 compatibility update), scatterer now uses .half files, any .raw files will be converted to .half IF NO .half FILE EXISTS. Therefore copy the .raw files like usual and delete any existing .half files, the new .raw files will be converted automatically to .half, you only need to distribute the latter. Sorry this is a bit messy, I'll try to update this tool soon. 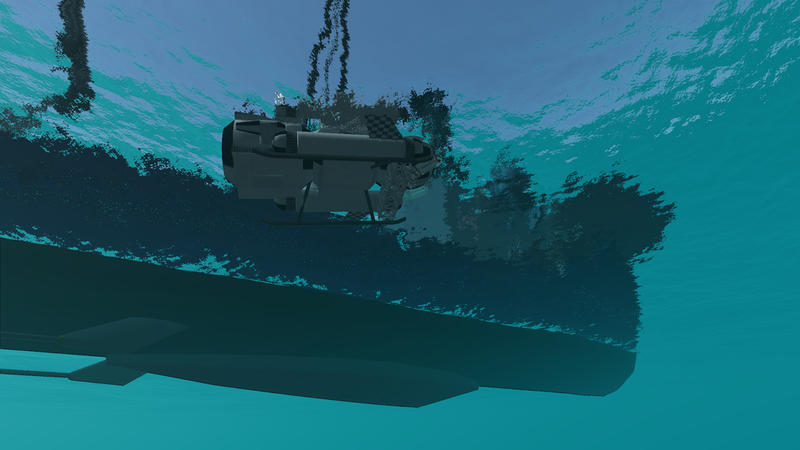 -New water effects: Water refraction, depth-based transparency, contact foam and underwater surface and underwater "fog"
-EVE cloud integration, scattering is now applied to clouds and they change colors at sunset (old shading still an option from main menu, useful for EVE 7-4 and visual packs that aren't reconfigured for the new system. -Added kopernicus ring shadows, rings can now cast shadows on planets (if using the new EVE integration, the shading may not look right, it's better not to have clouds on a planet that has rings ATM, old cloud shading works fine). -Sunflare changes intensity and color when seen through Kopernicus rings. -Added sun flare ghost fade-out after a configurable distance. -Effects now work in tracking station. -Fixed atmospheres wobbling when observing far away planets in map view, ie planets that the active vessel is not orbiting. -Fixed ocean reflections and foam being very faint. -Fixed "experimental viewdir offset" flipping directions sometimes, this should fix the band over the horizon. -Fixed re-entry effects rendering behind ship. -Removed nearClip Parameter and fixed "slicing" on objects close to camera. -Fixed ocean and postprocessing shaders causing artifacts on Texture Replacer's reflections. -Fixed high ambient light issue on ship when disabling ambient light in scaledSpace. -Sunflare now shows correct extinction from all distances, previously all extinction effects disappeared when the PQS is disabled. -Planets now have an individual "mainSunCelestialBody" setting. Useful for multi-star system mods. -Fixed weird and greenish coloration in postProcessing shader and sky shader especially visible near the horizon, both effects are back to being realistically blue. -Fixed eclipses nor working correctly in map view when viewing planets other than the active one. -Much faster, nearly instantaneous loading, reverting a flight you no longer have to wait 10 seconds, effects enabled in map view for planets other than the active one and will load on demand. -.raw format replaced by .half format, which enable faster laoding and smaller filesize, if you created your own .raw files using the config tool, delete the .half files and any .raw files will be converted automatically to .half the first time the planet is loaded. YOU ONLY NEED TO DISTRIBUTE THE .half FILE. -Option to ignore renderType tags, keep this on for the time being as rendertype tags seem to be gone in 1.1 and the postprocessing shader won't work without them. -No longer need to reload the tables when switching fullscreen/windowed, only ocean needs to be reloaded. -Added an ocean offset reset when it gets bigger than 20000, avoids floating point precision issues resulting in artifacts or a blocky-looking ocean when traveling a large distance over the ocean such as doing a sub-orbital hop or doing a fast re-entry. -Gui keys are rebindable through the config file. -New option to draw the atmosphere over EVE clouds: Fixes strange-looking terminators when using both EVE and scatterer and looks smoother in general, however it makes the transition from PQS to scaledSpace more problematic and introduces some new issues. Can be toggled of from the main menu or for individual planets throught the planetsList.cfg file. 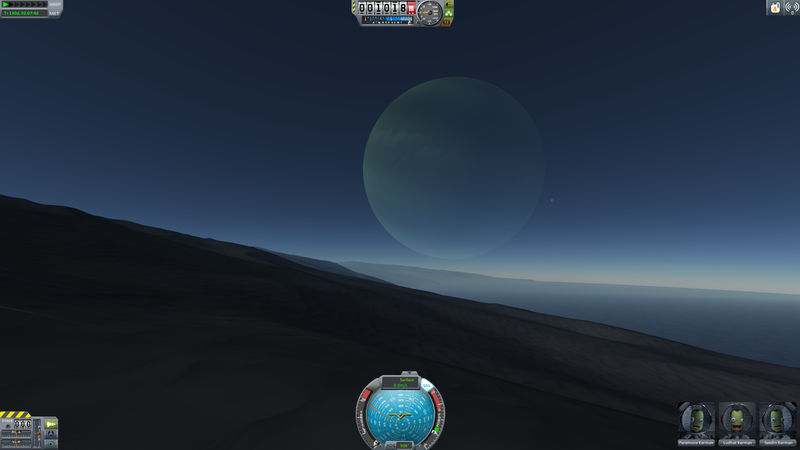 -Fixed draw order issue where clouds on Jool render over Laythe's sky. -Partially fixed compatibility with telescope mods: Will work correctly in high orbits (>160 km) with the planet rendering correctly and no overlaying layers, however will get some interference from the postprocessing shader when PQS is active (below 160km for Kerbin). -Visor reflections (TextureReplacer's reflection plugin) should also be fixed, with the same limitations as the telescope mods. -Ocean no longer disappears when you rotate the camera, do flips in IVA or get to orbit. -FakeOcean removed, regular ocean stays all the way to high orbit. -Added ocean alpha setting to configPoints to fade out the ocean nearing orbit. -Better way to disable the stock oceans (thx to rbray89), gives a small performance bump. -Added godrays: Early WIP, disabled by default, these work best with good terrain so turn up your terrain quality. Looks best with terrain shadows. 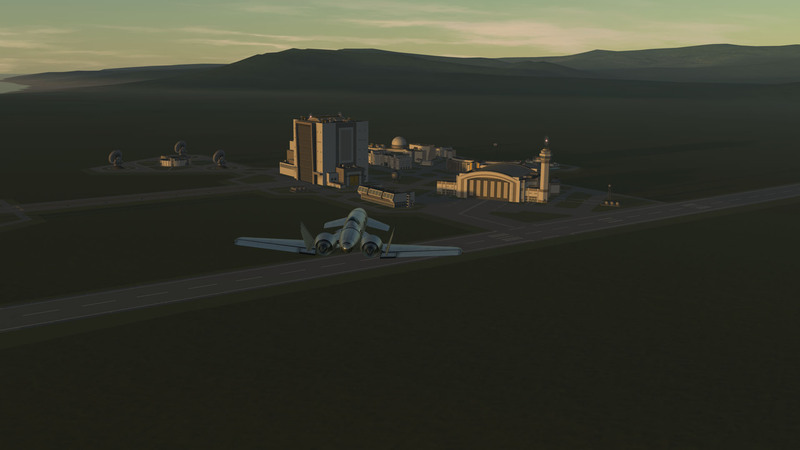 -Added terrain shadows: These depend on the unity shadows, if you see shimmering or artifacts turn up your shadow quality through the "render quality level" slider in KSP. The default shadow Cascades setting of 4 seems to work quite well. Shadows distance has also been changed from 5 000 to 100 000, this is adjustable in the scatterer config file. -Added custom sunflare shader: WIP, configurable through custom textures and config file. 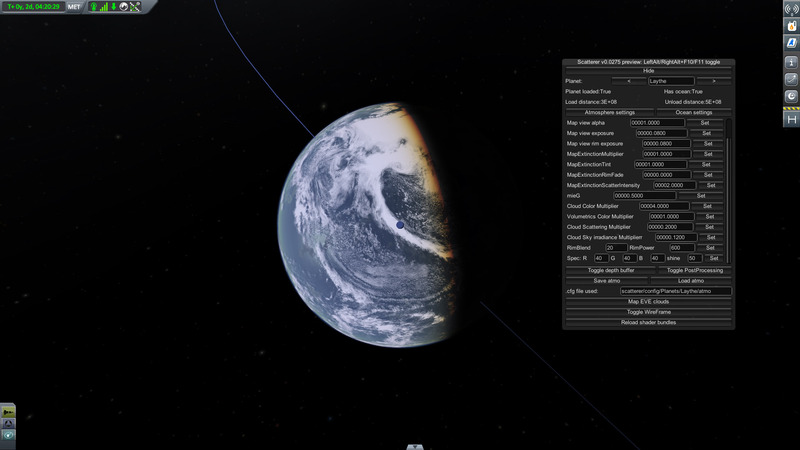 -Added eclipses: WIP, appear only on sky and orbit only for now, no terrain shadows. You can set eclipse casters through the planetsList file. -Tweaked configs for a bunch of planet, ground to orbit transition is much better on Kerbin especially. Didn't have time to redo Duna so it probably loooks really bad. -Fixed custom depth buffer artifacts (threshold of 10 is enough for all altitudes now). -Moved all render modes to the custom depth buffer. -MapViewScale setting no longer required. -PostProcessing now has extinction like the sky shader. -PostProcessing blending mode changed from alpha blending to soft additive, basically it blends better and feelsless foggy during the day and more foggy at sunsets/sunrises. -Sky extinction is now handled via analytic formula, this fixes the bug where sometimes extinction doesn't work with custom configs, beware that objects in the sky are still handled via the old method so this may not fix it. It also looks a bit different so you might have to redo your configs. -In addition to their alpha and depth settings, the postprocessing and fake ocean both fade out automatically following how much the PQS is faded out. -Added ocean faking in postprocessing, prevents rendering the expensive ocean when far away and used in orbital view instead of showing the ocean floor. -Added compatibility with RSS, to use with RSS replace config file with the one in "RSS compatibility folder" or go into the config file planetName and change the celestialBody to Earth but keep the other name to Kerbin. 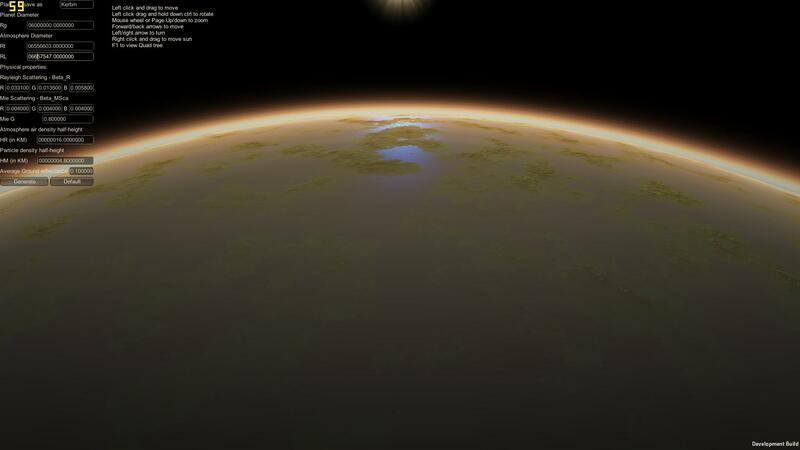 -New orbit shader, tweakable through the parameters sky extinction and sky extinction tint. -Map view now has separate settings which only trigger in map view. Settings can be saved with the save settings button or they get saved automtically when the scene is changed. -Effects no longer lag behind as you move the camera. -Auto depth adjustment based on height (WIP/experimental). -Kerbin no longer covered by blue sphere after altitude of 160 Km. -Few adjustments to the base settings, more subtle effect. -UI now defaults to hidden, can be enabled with Alt-f11 or Alt-f10. Looks lovely! 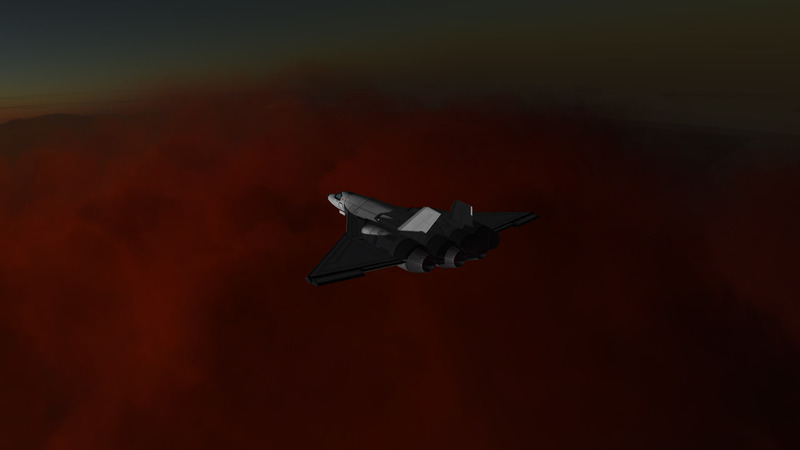 I really wanted to have some more.. epic sunsets and sunrises in KSP for a long time! I hope you can fix all problems! This is what I missed for a very long time. Do you also have any plans to support RSS in future? i'll be following this closely, good luck! Yes, this shouldn't be hard to do, I also plan to include a way to configure it for mods that add custom planets. There are some atmospheric scattering effects in EVE (you can see them in Astronomer's pack), but this one looks promising because EVE will be dead in 1.0 most likely, as RBray is no longer interested in updating it it seems. Does anybody know of a way to disable rendering (and not just hide with something else) of the stock atmosphere? This could be useful. That's first pic wow! I can finally make kerbol look fancy! Oh my.. sorry. Allergies. Tis the season. Seriously though this is awesome. I hope the two can one day be combined. I found a temporary fix for the line artifacts, simply bump the visual settings down to "fast", this doesn't seem to affect KSP's visuals much but it disables shadows. I don't see a reason why this wouldn't happen, I've already seen someone combining this with clouds. 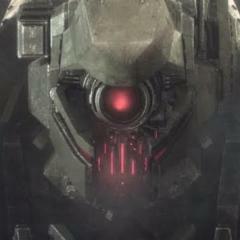 Which components of the Atmosphere do you want to deactivate exactly? With this little function I threw together, you can deactivate the mesh-renderer for the atmosphere, but that results in a black "atmosphere" in the PQS-view. Thanks a lot, I'll try this code and experiment with it later today. Right now my atmosphere renders as pitch black during the night, I can make it transparent below a certain threshold in order to be able to see the stars and the moon at night but the stock atmosphere effects end up messing with it during sunrise/sunset. I didn't know the stock atmosphere had components but I'll probably disable them all. Anyway, if you're familiar with meshes, if I use a meshrenderer for my atmosphere I have a huge performance drop, everything starts running at 5 fps. What's the deal with this? I'm currently rendering my atmosphere with graphics.drawmesh to get around this. Also, there are the line artifacts described in the OP which go away when i drop the visual settings of the game to fast. I had posted about this in the texture replacer mod thread once, but it didn't seem like it would be possible via that mod. I'm looking for a mod that can make less of the skybox visible while on the surface of a body with atmosphere and you are on the night side. My original idea was to use texture replacer to add a second skybox behind the first. The first one would contain gas clouds, nebulas, galaxies and other phenomenon that are not normally visible from within atmosphere. That layer would have it's alpha level dropped as you plunge into atmosphere, and vice versa. It should never reach 100% either, so that you can always see the same stars behind/through it. Seems that my idea would require a plugin of it's own, which I have no idea how to write. Perhaps this is a feature you may want to explore. blackrack, could you please upload your preview version to another hoster? I can't reach MEGA for whatever reason.. Here you go, I trimmed off the fat so this version should have better performance than the first. I guess this is feasible, though I'm not personally interested in it I guess I could make it an optional feature or a separate mod once I'm done polishing up this one. Im not really familiar with the meshes, but with the structure of the atmospheric components. I just rendered a completely new mesh with it's own shader and material that occldue the old sky but didn't set any alpha transparency. I did this now but sill have to remove/tweak the old atmosphere and my messed up dx9 shader. Oh wow, this looks fantastic! Definitely keeping my eye on this! EDIT- I can only pick credits and quit can't move or close the window to pick start. Holy crap this looks incredible. I love this already. Sorry about that, alt-f11. Get the new version though. The window says "Mod active: False"- how do I enable it? Is it working in OpenGL? -Is this compatible with dx11? Alt F11 doesn't close the window in Linux so the window stays up all the time.